This European-style food hall has been operating on the ground floor of the iconic Homer Laughlin Building since 1917. Even if you’re not there for the food, it’s worth a trip; people from all corners of LA mix and mingle among rows of spices, produce and vintage neon signage. Grand Central Market is the best options to look for food or something to drink such as beer, coffee, or tea. Before we pick what to eat Tyler and I grabbed some beer at Golden Road brewing. I personally was not a beer person but I think they have a great of beers options. After that, we had a pastrami for lunch. It was my first time eating pastrami. My other favorite place to eat in Grand Central Market is Eggslut, the combination between orange juice and egg sandwich is a perfection. After satisfied with our yummy lunch, I took Tyler to my favorite dessert spot, Bottega Louie. They have the prettiest dessert I have ever seen. I always love their macarons but we ended up getting their berry tart. There is actually a restaurant in Bottega Louie as well. Our next stop is Los Angeles Public Library. To be honest, I do hate the library, especially the one on my campus because I always procrastinating all night to finish my paper. Haha. Actually, to visit library even a bookstore just to explore is something that actually very interesting to do. My favorite part usually is visiting the international section where I can see all books from different countries. Architecture or interior design books are also my number one favorite. Since I was a kid, I hardly read story books but architecture because my dad has tons of collection of them. It is fascinating for me to see beautiful design of places. 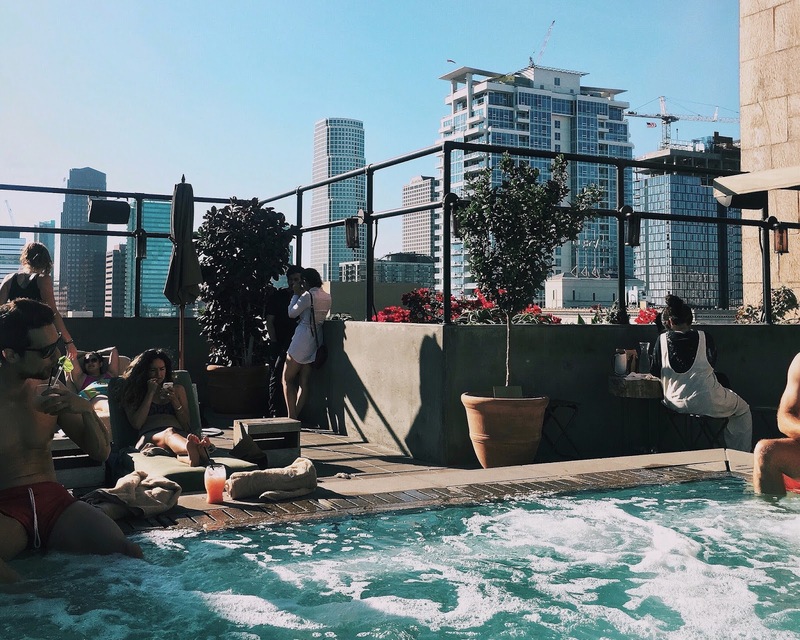 Ace Hotel is the best spot to enjoy a drink while chilling at the rooftop poolcuzzi (a pool with jacuzzi size) in the summer. Some tips: bring your bathing suit or wear it under your clothes, don’t forget to bring sunscreen! You can also enjoy the view of Downtown LA from above. What’s your favorite spots in town?